Usually our holiday weekends tend to be laid back and uneventful. Since we spent the better part of 15 years trying to fight our way through Chicago traffic to get home to Indiana for the long weekends, now we generally stay put. But this year we ventured to Wisconsin which is, as you know, on the other side of Chicago. We went for a wedding, and what a wedding it was! I always love a really good Lutheran wedding! On Friday we went to the Milwaukee Zoo, which has been a favorite since we lived up there over 15 years ago. We enjoyed it, but it also made us appreciate how really wonderful our Fort Wayne Zoo is. We decided to drive home on Saturday night to avoid traffic and be home for church, although we would have gladly visited our former congregation in Wisconsin if it hadn't been for that traffic thing. I'm glad we did, because we had incredibly clear roads. I've never seen them that empty. Sunday we saw the third installment of Pirates. I've heard some say that they didn't enjoy this one, but maybe I just have lower expectations. I thought it was fun. We ate popcorn and laughed for almost three hours. Monday I went with my mom to the cemetery to put flowers on some graves. There is a tradition in some areas around here to not only decorate military graves, but also those of other loved ones. Having lost both of her parents in the last eight months, this was a significant outing for my mom. The cemetery was just beautiful, with flower arrangements on a large portion of the graves. Afterward we drove around in the country and talked about people and places she remembers. They also planted eight little trees. It will be a long time before they amount to much, but they're planted. I want to get some garden pictures posted later today. I was tagged by RPW for this meme, which actually looks harder to me than some. Here it is.... "What did you want to be when you were 5, 10, 15, and 20? When I was five I am pretty sure that I wanted to be a teacher. I made my three year old brother and my mom be my students so that I could play school. I also wanted to be a ballet dancer. That was before the I understood the reality of the body type that I possess. It is a type that has served generations of sturdy German farm wives very well. It is not a ballet body. When I was 10 I wanted to manage a department store because my friend Jandha had the best clothes and her dad was the manager at J.C. Penney. When I was 15 I wanted to be a writer. When I was 20 I still wanted to be a writer. Now I'm 42 and I still want to be a writer. I've written a lot and have even been paid for some of it, but I want to do more. Who can I tag? I don't think that there are any Loopers left so I'll go outside the Looper bounds and tag Jen and Bethany. I made the mistake of trying to update my blog tonight. My homeschooling blog is new blogger, so I didn't think I'd have any trouble. Ha! The biggest problem was replacing all of my lists that I'm on. I still can't get some of the little graphics to show up, so I'm going to need to redo them. And it really messed up my blogroll. It didn't recognize all of the headers, so it squished several categories together. I still need to fix that. I do think that I'm going to like the new look. Lutheran Carnival L is up! This week's Carnival of Homeschooling is up at The Lilting House. I have only been in the carnival once before,over a year ago, when I was invited to submit a particular post. I really like the post that I sent in this time. I think that it has value for all parents, not just homeschoolers. When I saw that the theme had to do with cooking, I knew that it would very likely be a picture taken at my mom's house. Although I do tons of cooking, there aren't many photos taken. But when our families are together I'm always taking pictures. The challenge was finding a picture that wasn't completely unflattering of the person doing the cooking. My mom is looking a little tense as she gets the Thanksgiving noodles ready. Since it isn't the best photo of her, I decided that I'd better add another one. It is totally off topic, but this is my gorgeous mom with my step-dad and my little brother on his 40th birthday. Go check out HowThe Lord of the Rings should have ended. Short and sweet. One of my favorite sounds on this earth is the sound of male voices singing. A couple of times a year I have the privilege of being at the seminary for a service with a full-ish chapel. Today was such a day, and in spite of the mediocrity of the hymns and the less-than-wonderful Divine Service II from LSB, I did get to enjoy the full volume singing of This is the Feast and one hymn. Those voices singing those songs in that setting always give me goosebumps. I can now officially call what was last week a pile of dirt and stones a garden. We planted beets, turnips, three kinds of lettuce, thyme, and catnip seeds. We planted strawberry plants that are already flowering or near to it. We planted three kinds of tomato plants, red, green and banana peppers, zucchini, cukes, and acorn squash. There are a few more zucchini and squash plants to be planted over along our fence by the former and future compost pile. We also want to plat some peas just outside the raised part of the garden and they can climb the wall. The best part was having our feet in the soft dirt with the sun on our backs. All four of the kids helped, although I'm not sure if Patrick actually touched the dirt with his hands or not. I was talking to a friend about the fact that these are going to be some very expensive veggies when you factor in the piles of rock & dirt. She couldn't understand why we'd go to the trouble when we can buy good organic veggies from a farmer a couple of miles away. A big part of the reason that I wanted a garden is because work is good for kids. Work that produces something of value and really contributes to the family teaches them lessons that nothing else can. I also think that we've lost too many basic survival skills in our culture and knowing how to grow and keep food is one of the biggest. My mothers' day present was 2 1/2 tons of landscape blocks and six yards of dirt so that I can have a nice raised-bed garden in my back yard. Colin and the boys worked hard all afternoon Sunday laying the blocks. Yesterday a huge pile of dirt was delivered. (Although we ordered six yards, Colin thinks we got more like nine or ten yards.) The guys worked for several hours moving the dirt by wheelbarrow from the driveway to the garden. The garden is full but we still have a pretty good pile of dirt. Today I am going to start with the planting. I haven't had a garden for years, so I am really excited about my own fresh veggies this summer! For this Photo Hunt, I chose a picture of the time when our family was still just FIVE people. Bethany is six, Patrick is two, and Jonathan is a few months away from making his debut. 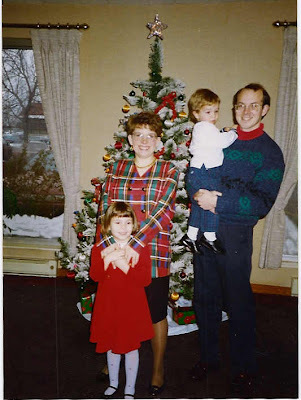 This was taken in front of the Christmas Tree at the Ramada Inn in Lafayette, Indiana. We were having dinner at Damon's to celebrate my husband completing his masters at Purdue and the fact that I no longer had to work a Damon's. My friend Jennifer tagged me. I am supposed to write seven unrelated, random, uninteresting things about myself. Then I need to tag seven other people. 1. In the last 40 hours I have driven over 600 miles, been sunburned, drenched by rain and food poisoned. 2. When I was in junior high I wrote with a purple Flair and dotted my i's with a little flower. 3. I am allergic to the smell of lilacs. 4. I prefer silver jewelry to gold. 5. I like to write on yellow legal pads or graph paper. 6. I went to Girl Scout camp when I was a kid. 7. I met my husband when he was our family's paper boy. I tag Melynda, Julie, Polly, Bethany, Marie, Lora, and Susan. The past few days have been hectic, but fun. This weekend we had a visit from our good friends from Wisconsin. Saturday evening Melynda and the Rebellious Pastor's Wife joined us all for a mostly-indoor cookout. The kids ran and played for hours, taking only a short break for food. We adults sat and talked, and talked, and talked. After that we enjoyed the final Bach Collegium performance of the year. The performance was fantastic, but the pews were the most uncomfortable that I have ever endured! After a day of constant running today, most of us leave at 6:00 am for a tour with Jonathan's choir. We'll traipse around Michigan for a couple of days visiting Frankenmuth and Greenfield Village, and hearing the kids sing at several Lutheran schools along the way. Two of my boys running on ahead of the rest of the family on a walk through the woods last fall. There was absolutely no way that I could limit myself to one picture on the subject of childhood. I think we're almost destroyed childhood in our society by not giving children enough time to play actively and imaginatively. We over-schedule them and load them down with homework, but at the same time they often have little useful work to do. We try to entertain them to stave off boredom, giving them TV shows that make them grow up too fast and clothes that make them look like miniature teenagers. Making sure that my children have a childhood has been one of the great side benefits of homeschooling. This is my oldest niece having a fantastic time at the park near our house. These are my two youngest nieces with that childhood staple, Cheerios. Me, with my cousin Ann, who is still a lot taller than me. 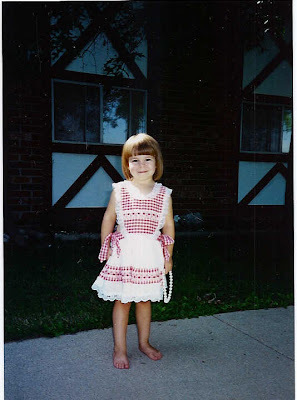 Bethany, at four, wearing one of her favorite things. Her childhood was one long game of dress-up! As Bethany mentioned yesterday, I went to the Vera Bradley Outlet Sale. It was quite an experience! This event was going on the week we moved here five years ago, and I had heard about it from people in Illinois, but I didn't realize what a big deal it is until after we had moved here. People fly here from out of state, because they figure that they'll save enough money to pay for their plane tickets. Women fill multiple garbage bags with purses totes, etc. The company had to set a $2000 limit on what individual customers can buy after shoppers on the final day last year didn't have merchandise to buy. I was fortunate to have been given a ticket for the Tuesday afternoon portion of the sale, before the actual event begins in earnest, and was among the first few hundred people into the sale. Even at that early hour, there were women who were disgruntled that 200 women would enter the Expo Hall before them. Everything was either 25, 50, or 75% off the retail prices. It was amazing to watch women moving down the aisles at top speed grabbing the desired items and shoving them into bags. I have a few Vera Bradley pieces that I've received for gifts, but a Vera Bradley sale isn't where most people who know me would expect to find me. I didn't have a particular agenda, so I was able to take my time and look around. A lot of the fun was watching the women who were almost in a panic that they might not get the piece that they wanted. I did manage to find some great Christmas presents at 50 and 75% off. I bought a black microfiber bag that I had been looking at. Since I got it for $15 I'll enjoy it a lot more than I ever would have if I'd paid $60 for it.